Jebel Akhdar in Arabic means “Green Mountain” but it is also known as the Sayq Plateau. Your guide will take you for an incredible journey. Make your way to the pretty village of Birkat Al Mauz, located at the foot of Jebel Akhdar. Wonder in the old streets of abandoned houses made of mud and straw. Your guide will take you to the top of Jebel Akhdar, also famous for its rose, fruit and nut plantations, there are many small villages which farm some of the best in Oman. 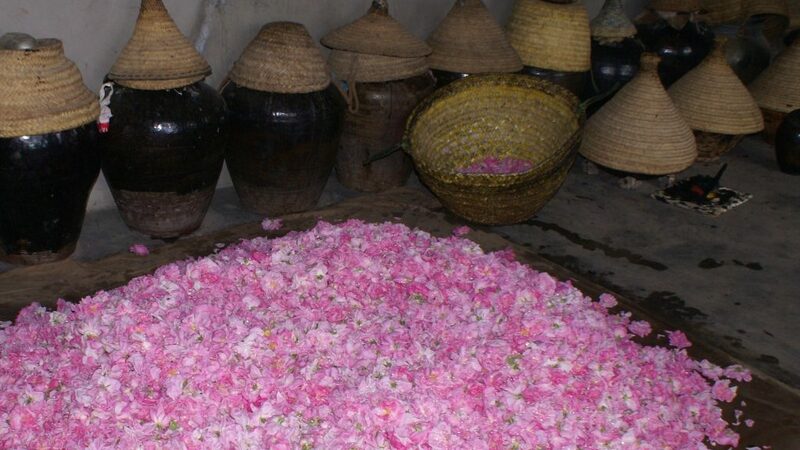 Depending on the season you can visit the rose water factory, rose water from Jebel Akhdar is very famous in Oman. From a view point, see the villages on the other side that cling vertiginously to the rock walls, as well as the terraced rose plantations. If you wish you can do the trek W18b from Al Aqur village, your guide will meet you at the next village. Explore the hanging gardens before heading to your last stop, Wadi Bani Habib. A charming little abandoned village perched on a wadi, there is a trek to reach the village but you can also see it from the road. This tour is a delightful way to escape the heat because of the cooler mountain air.